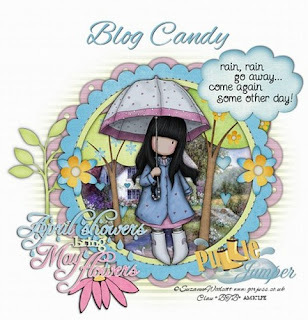 Stamping Stuff: Blog Candy Alert! Today it is raining buckets out there LOL! First real thunderstorm of the year I would have to say. Ummm I think you are supposed to get off the computer then but I don't see any lightning so I am going to keep plugging along! I don't really like that it is raining since I have errands to run later BUT I am so happy for this and not that awful white crap to be coming down :) Warmer temps too WOOHOO! Ok so here are a couple blog candies I found this AM while perusing my emails and boards. Starving Artistamps have some pretty cool and funky stamps! I would love to have a whole collection of them... Check out the newest offerings from them and then spread the word and enter the candy contestto help them celebrate the new release! Kim at Paper in the Works has hit a milestone...100,000 hits! That is a lot! She if offering some fabulous candy in the form of a set of stamps from everywhere she was/is a designer! Get over there now and check her work out! Marvelous! I love you thiiiis much!